A countertop electric roaster can be a great convenience for busy cooks. You can use it for extra cooking capacity during holiday meals or family get-togethers, or use it as an alternative to your regular oven for roasting chickens or other meals. The countertop roaster won't heat your kitchen as much as a regular oven, and will roast a bird just as effectively. Place the roaster rack in your roaster's cooking pan, then put the pan into your roaster oven and plug it into the wall outlet. Set the temperature to 350 degrees Fahrenheit and preheat the roaster with its lid on for 15 to 20 minutes. Dry the chicken inside and out with clean paper towels, then season it with salt and pepper or other flavoring ingredients as you prefer. Place the chicken on the roaster's rack and replace the lid. Roast the chicken until it reaches a food safe internal temperature of 160 F when tested with an instant-read thermometer. Chickens of 3 to 5 pounds' weight require approximately 13 to 15 minutes per pound to reach that point, while large roasters can take up to 18 minutes per pound. Remove the cooking pan from the roaster using a pair of oven mitts or pads, and place it on a towel or trivet. Let the bird rest for 10 to 15 minutes, then remove it from your roaster and carve it. 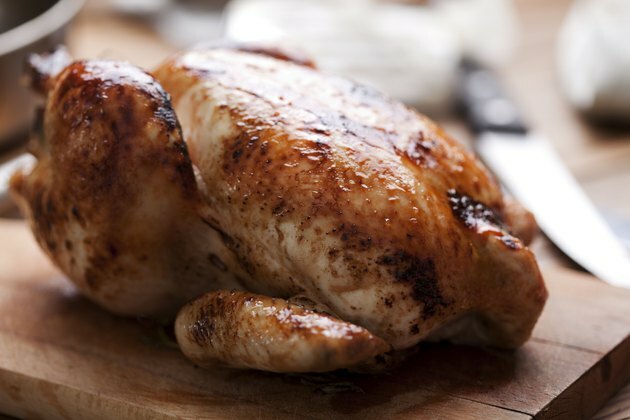 The roaster oven traps moisture inside its lid, so your chicken will remain moist but its skin won't brown and crisp. If you appreciate a crisp skin, transfer the chicken to your regular oven and brown it for a few minutes at 450 F.
Most chickens require 2 to 2 1/2 hours' cooking time in the roaster. Don't test for doneness until near the end of this time because countertop roasters can't return to their cooking temperature as quickly as conventional ovens. Preheating the roaster to 375 F, then turning it down to 350 F once the chicken is in, can shorten the cooking time by several minutes.